Thanks for getting in touch. To answer your smaller questions first, delivery of a puzzle engagement ring tends to depend partly upon when you need it, but we are 4 weeks out at present. The sizer is $3.99, if you want it ahead of time. 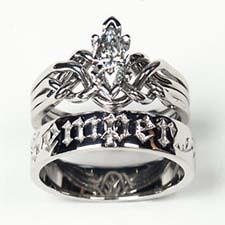 If you order the ring first, I’ll send out the sizer for free. As for your question about what happens if you don’t like the ring when you get it, I have two simple and seemingly contradictory answers, but, below, you’ll see what we offer you ahead of time, to ensure that you are thrilled with the ring you get. So here are the two answers: You have to be absolutely delighted with the ring, or I will work with you until you are or you have your money back. That is stated on our website in writing. At the same time, our site also states that we do not give refunds on custom items over $1,000.00, which each puzzle ring over that price is. Obviously, that’s crazy, so how can I expect you to take our refund policy seriously? The answer is that I prefer to ensure before you order the ring that you are a) certain about what you are ordering, and b) that there are no surprises and no disappointment along the way. Each and every ring is made specifically to order, so we would not be able to sell it to someone else, so therefore, we don’t, in fact, take custom rings back. So how do we make sure that you are not stuck with a ring you’re not happy with? We have developed a number of ways to ensure your comfort level, before you commit to ordering a puzzle engagement ring. Following are five choices, though not a single person has asked for even three of them (though there will be a first time). Generally, what steps to take is a matter of individual preference. In fact, most of our clients only choose step 1 and step 5, but lots of folks order the trial sterling silver ring, and other clients have chosen to have a sample ring in the desired style sent out with an inexpensive stone in it, to really get a sense of the ring. We will work with whatever your preferences are! 1. Order a sizer gauge or take advantage of our free resize. $3.99 with no need to return it. We send it out with free shipping. Using this sizer gauge makes for a more reliable fit, because it has pop-out rings, so she can wear one for a couple of days. On the other hand, if the ring is a surprise, just do the best you can in selecting a size, because we do offer a free resize for each puzzle ring (you just pay the round-trip shipping). 2. 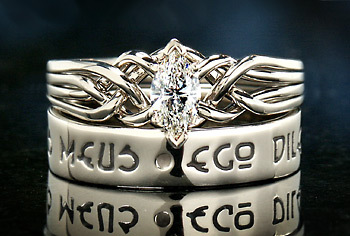 Order a trial sterling silver sample ring. Then we’ll apply the $60.00 cost to the engagement ring. This is an actual hand-woven four-band medium puzzle ring that allows you to evaluate quality, to learn how to put the ring together, before the diamond ring arrives. If you do order the engagement ring, we apply the $60.00 cost of the trial ring to your engagement ring order, and you get to keep the silver ring. 3. Order a trial gemstone puzzle ring, by phone, in the style you want with an inexpensive stone; we authorize your card, but you only pay shipping. As soon as we get the ring back from you, I capture only the shipping charges (round-trip), and the rest of the authorization falls off your card. This only works with credit cards, not with debit cards. 4. Inspect the diamond before it’s placed in the ring. Again, you pay only for shipping, although we authorize the value on your card. We usually prefer to send out the diamond in the ring, because you and she can get a true idea of how the diamond will look on her hand. And since, once you get the ring, you must be delighted with it or we will replace the diamond or adjust anything else about the ring, it’s fairly low risk to you to have us send out the finished ring. 5. Evaluate the ring when you get it and ask for any changes you need. Pretty much covered this in number 4, above. You may also want to explore our page about lifetime care for your puzzle ring. And, if you wish, you can sign you up for our email series, “Free Report # 2 – The Puzzle Engagement Ring Report.” It’s about 9 emails long, delivered once daily. I’ll be happy to work with you however you wish. Thank you again for your email today.